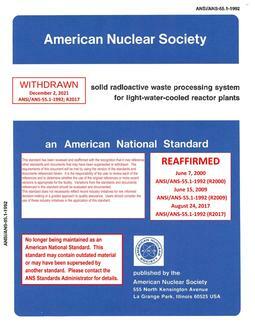 This standard sets forth the design, construction, and performance requirements for a solid radioactive waste processing system for light-water-cooled reactor plants. For the purposes of this standard, the solid radioactive waste processing system begins at the interface with the liquid radioactive waste processing system boundary and at the inlets to the spent resin, filter sludge, evaporator concentrate, and phase separator tanks. 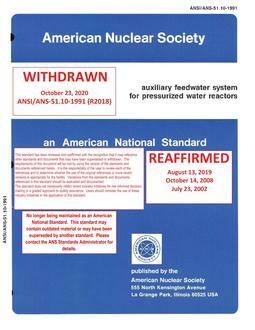 In addition, this standard pertains to dry active waste, mixed waste, and other solid radioactive waste forms that are generated as part of the operation and maintenance of light-water-cooled reactor plants. The system includes facilities for temporary on-site storage of packaged waste but terminates at the point of loading the filled drums and other containers on a vehicle for shipping off-site to a licensed disposal site or transfer to interim on-site storage facilities. 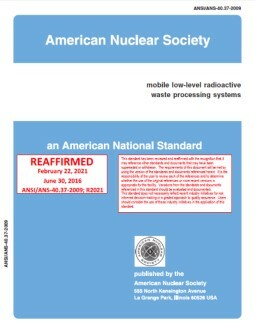 The solid radioactive waste processing system is not a safety class system as defined by American National Standard Nuclear Safety Criteria for the Design of Stationary Pressurized Water Reactor Plants, ANSI/ANS-51.1-1983 (R1988), or as defined in American National Standard Nuclear Safety Criteria for the Design of Stationary Boiling Water Reactor Plants, ANSI/ANS-52.1-1983 (R1988).